Throw away your sword and shield; your only enemies in this game are gravity and the heat of the smoldering blocks below. Jump your way through this trying course of blocks, traps, and free falls to secure the ultimate crystal prize at the end of the maze. How far up can you make it before you fall back down? 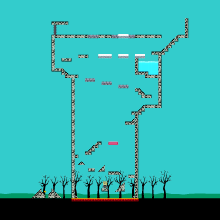 From the start until the very end, you'll find yourself jumping up, down and all around this map to reach block after block. Think you can complete it? Are you ready to make the jump?